Big Hookz is excited to perform his hit singles "The Lifestyles Pt.2 (ft. Kirko Bangz)" and the nationwide buzzing single "Pull Out Cash (ft. Kevin Gates)" at the iHeart Music Festival afterparty on Friday, September 22, 2017 at Reggae Beach Club in Las Vegas, NV. The event is hosted by Hip-Hop star Kirko Bangz. 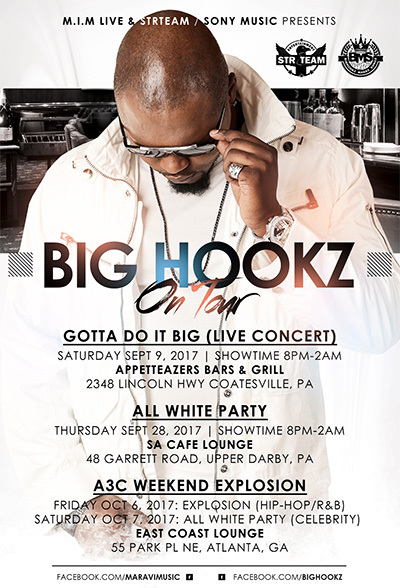 Sony Music recording rapper Big Hookz announced his upcoming tour dates for September and October 2017, which you can review above. Make sure to get your tickets to enjoy Big Hookz's shows! StrTeam head honcho and Sony Music recording artist Big Hookz has been hard at work lately promoting his blockbuster single "Pull Out Cash" featuring Hip-Hop superstar Kevin Gates, which is receiving nationwide radio airplay. Besides that, the buzzing rapper dropped a string of high end music videos like "Handle That", "Holdin You Down" and "The Lifestyle", which you can watch below. BIG HOOKZ & KEVIN GATES JOIN FORCES FOR "PULL OUT CASH"
Indie powerhouse StrTeam Ent. and Penalty Ent./Sony Red teamed up with Hip-Hop superstar Kevin Gates for the breakout single "Pull Out Cash". The music video already received more than 200,000 views on YouTube and countless radio play on major stations. Str8 Team Ent. signed a 2 years agreement with Penalty Ent./Sony for a Distribution and Services from Sales, Distribution, Marketing, radio Promotion, Video Promotion, Production Coordination etc. and all deliverables. Big Hookz’ “Make A Milli” video was voted in the Tri-state Area (NY, NJ, CT) as the number #1 video for the month of January till Mid February 2017 via VideoCity. Big Hookz’ single “Pull Out Cash” hits over 500 BDS national radio spins across the USA and Canada from the month of October 2016 till December 2016. Big Hookz’ single “Make A Milli” hit #5 on the national chart for the DRT online radio at the month of September 2016 and # 2 on the International Chart for the DRT Online radio. Rising urban Hip-Hop label Str8 Team Ent.’s music video for the single “Third Eye” has been featured on urban powerhouse WorldStarHipHop.com. The highly anticipated mixtape of the same name will be released on October 31, 2014 via DatPiff.com for free download. In related news, Str8 Team Ent. will be going on tour soon and donate the revenue to fight Ebola in Africa. The tour itinerary will be announced, stay tuned. Premium urban video network TrillaTV.com premiered Big Hookz’s blazing video “Pour Up”, featuring XLG Skenny and Main Mane. The video received over 10,000 views in a couple of hours since its release on www.trillatv.com. Str. 8 Team Ent. head honcho Big Hookz is at it with a new stunning video for his single “Homicide.” The video premiered at Vevo.com and already received over 5.000 views since its official release. Str8 Team rapper XLG Skenny is excited to officially release his smash hit “Boomerang” on October 20th. 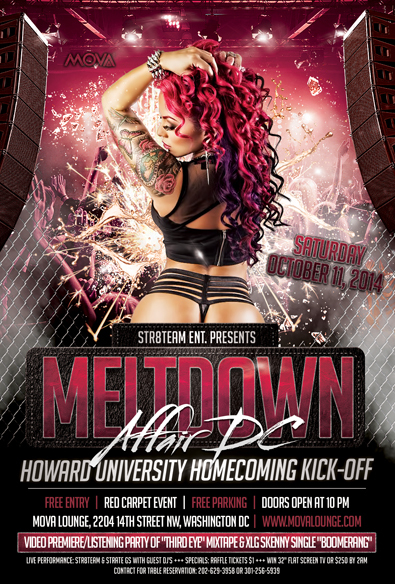 To hype up the anticipation Big Hookz’s right hand man unveils the awaited music video on October 11th during the label’s “Meltdown Affair DC” party at the MOVA Lounge, 2204 14th Street NW, Washington DC. Oct. 17th, 2014: XLG Skenny performs live at the Howard University "Homecoming Event" at Layla Lounge in Washington DC. Oct. 18th, 2014: XLG Skenny and his Str8 Team Ent. crew perform live at Howard University's "Homecoming Block Party" at the university campus in Washington DC. 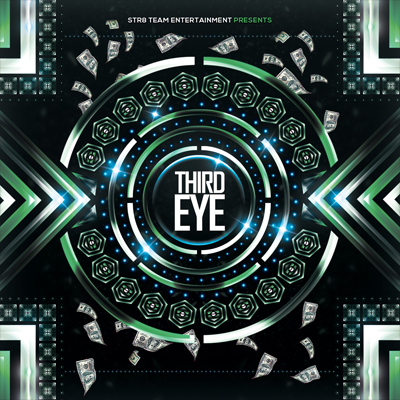 CEO Big Hookz announces the release date of Str8 Team Entertainment’s highly anticipated mixtape, “3rd Eye”, which will be released on Saturday, October 11, 2014. Furthermore, the music videos for the lead singles, “Third Eye”, featuring XLG Skenny, G Banga, Big Hookz and Lil Tizzle, and “Pour Up”, featuring XLG Skenny, Big Hookz and Main Mane, will be unveiled on the same day. XLG SKENNY TO RELEASE NEW SINGLE "BOOMERANG"
Str8 Team Entertainment rapper XLG Skenny is excited to release his banging single "Boomerang" in September 2014. The music video is currently in the works and was shot in Washington, DC. Visit the artist’s promotion page below to listen to "Boomerang" and make sure to get your copy on iTunes and Amazon. CLICK HERE to listen to "Boomerang"
Str8 Team Entertainment gears up for the release of its compilation titled "3rd Eye", which is set to drop end of September. The anticipated project features the label’s artists such as Big Hookz, XLG Skenny, L.Maxim and other established artists like Moe Mitchell, G Tha Masta Mind, Awthentik, Banga, Lil Tizzle and more. Spearheaded by the singles "Pour Up", "3rd Eye", and "Homicide", the compilation is sure to blow your speakers at first listen. The videos will be unveilled shortly so stay tuned! 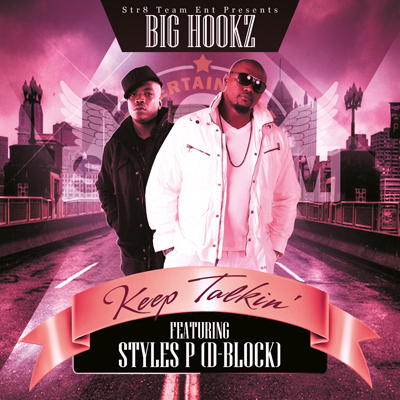 BIG HOOKZ DROPS VIDEO FOR HIT SINGLE "KEEP TALKIN"
Str8 Tem CEO Big Hookz presents his blockbuster music video to his hit single, "Keep Talkin", featuring The LOX member Styles P. The stunning video has been featured on WorldStarHipHop.com and can be watched below. 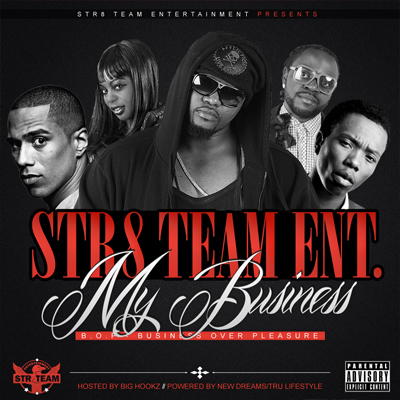 Str8 Team Entertainment head honcho Big Hookz released his acclaimed mixtape, "My Business", including major features with one of Germany’s hottest R&B crooners Moe Mitchell, DMV rapper Awthentik, XLG Skenny, Lil Tizzle and more. The mixtape can be downloaded at DatPiff.com. Str8team Ent represents the face of indie artist all around the world, growing bigger and stronger as the trend in music & film is constantly changing, proudly recognized by growing World music and films Independent Festival, Hollywood in DC, best music video DMV 2012- Paralize, best pop music video DMV 2013- Rock my body. Proud to announce visit with Talk show host/artist/actress Kanika Feaster, Baltimore MD. - 5k, “Walk to lose” by lady Maxim 2014 summer, exercise is the key to high performance.